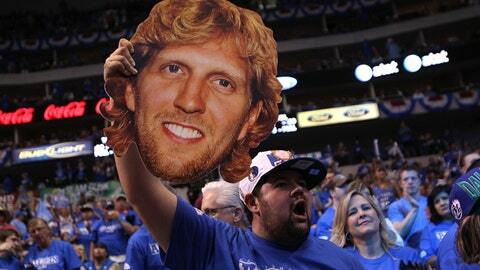 Dallas Mavericks fan cheers with a Dirk Nowitzki cut out. "You are being issued a warning that the comments, gestures and/or behaviors that you have directed at players, coaches, game officials and/or other spectators constitute excessive verbal abuse and are in violation of the NBA Fan Code of Conduct. This is the first and only warning that you will receive. 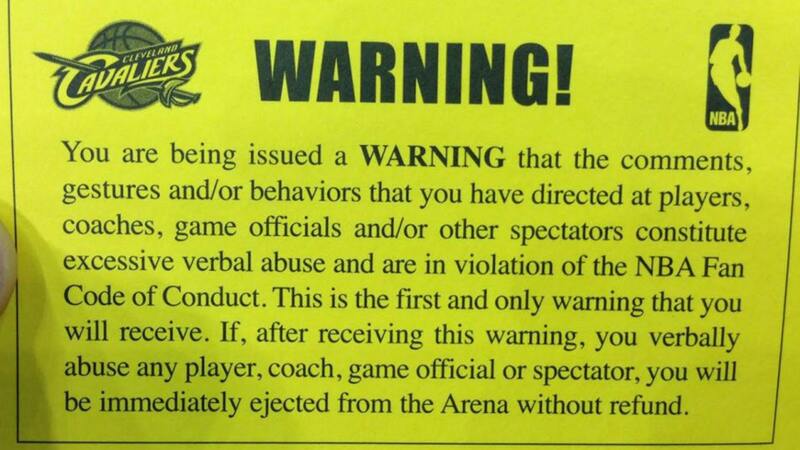 If, after receiving this warning, you verbally abuse any player, coach, game official or spectator, you will be immediately rejected from the arena without refund." The policy moved into the spotlight this month with a Pistons-Bucks game in which Brandon Jennings returned to Milwaukee and a note on a warning at a Knicks-Cavs game last year in which Cleveland fans were harassing Tyson Chandler (above). 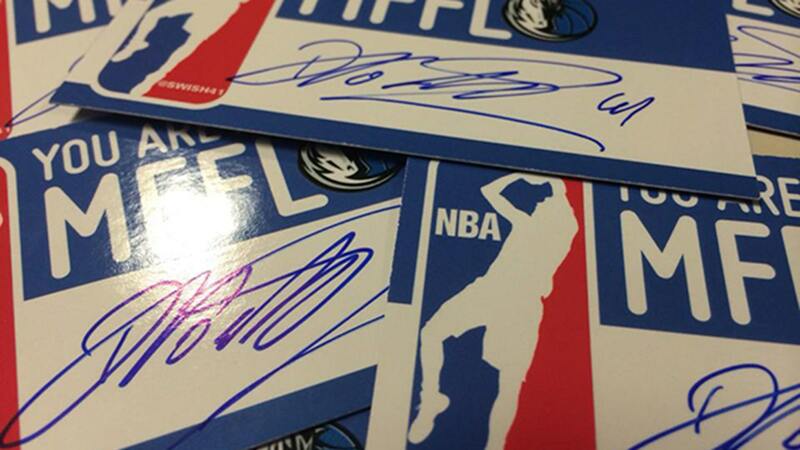 And on the front will feature a Jerry West-esque logo featuring Dirk Nowitzki … along with a Dirk signature. 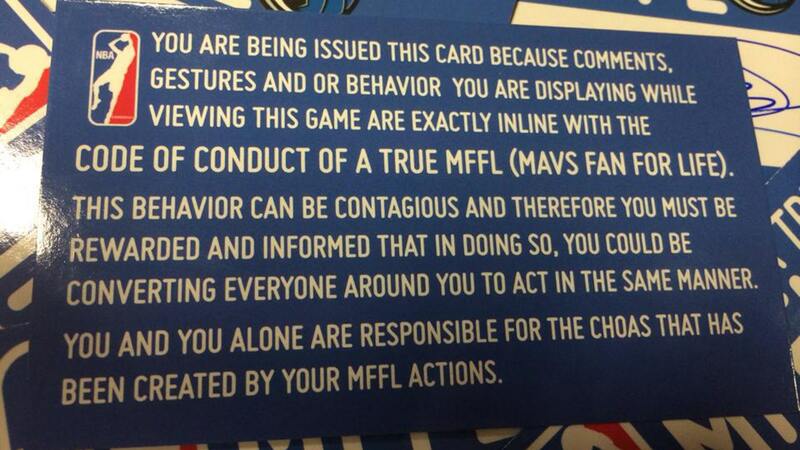 "You are being issued this card because conduct and or behavior you are displaying while viewing this game are exactly inline with the CODE OF CONDUCT OF A TRUE MFFL (MAVS FAN FOR LIFE). "This behavior can be contagious and therefore you must be rewarded and informed that in doing so, you could be converting everyone around you to act in the same manner. Yes, the word "chaos” is misspelled. (DallasBasketball.com is assured the team will get that corrected in the next printing). But for now, that’s probably OK. The Mavs are asking you to be a yeller, not a speller.